YEREVAN, SEPTEMBER 16, ARMENPRESS. 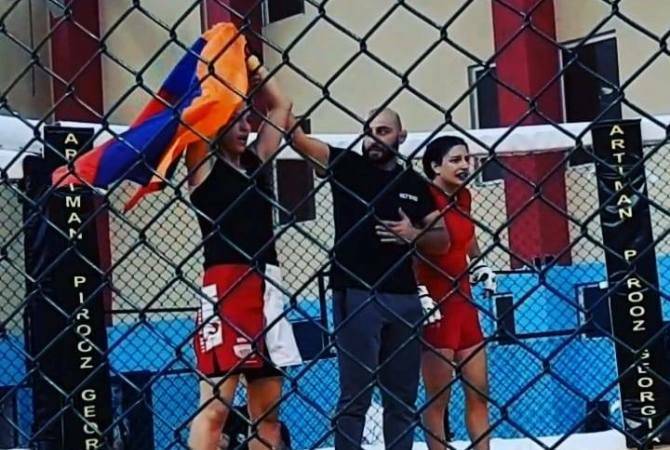 Armenian professional MMA fighter Karine Karapetyan has triumphed over Azerbaijan’s Rena Safarova in the Tbilisi International MMA Championship in Georgia. Rena Safarova is the sister of Ramil Safarov, the Azerbaijani army officer convicted for the 2004 shocking murder of Armenian officer Gurgen Margaryan during a NATO training program in Budapest, Hungary. The Armenian lieutenant was 25 years old at the time of his murder. “I dedicate my victory to the memory of Armenian officer Gurgen Margaryan,” the MMA fighter said on Facebook. The murder happened during NATO Partnership For Peace English-language courses. In the night of February 19, 2004 Safarov, armed with an axe, broke into the dormitory room of Gurgen Margaryan and attacked the Armenian officer while he was asleep. He delivered multiple blows to Margaryan with the axe. After nearly two years of trial, a Budapest court sentenced Safarov to life imprisonment. However, on August 31, 2012, Safarov was extradited to Azerbaijan, where he received a state-level hero's welcome. President of Azerbaijan Ilham Aliyev promoted Safarov to the rank of major and provided him with over eight years of back pay. The same day, Armenia severed diplomatic ties with Hungary. Edited by onjig, 28 September 2018 - 01:18 PM.